Neenah, WI - Marketing and e-commerce professionals from J. J. Keller & Associates, Inc. spent the weekend helping LEAVEN — a nonprofit organization that supports low-income individuals throughout the Fox Valley — as part of the company’s annual employee giving event, Give Camp. From Friday afternoon, October 5, through Saturday night, October 6, a team of graphic designers, copywriters, direct mail experts and others worked closely with LEAVEN staff to develop marketing materials for the new LEAVEN Community Resource Center. Give Camp provides J. J. Keller associates with a unique opportunity to give back to the community they love and support a local nonprofit, all while doing what they do best. The event is arranged in partnership with the J. J. Keller Foundation. “Our staff and volunteers were absolutely blown away by what J. J. Keller created for us — we never dreamed we’d receive such creative, high-quality pieces,” said Mary Parsons, executive director of LEAVEN. LEAVEN provides limited financial assistance to individuals who are struggling to meet their basic needs and connects them with resources to help them gain long-lasting stability. It was chosen as the nonprofit organization for J. J. Keller’s Give Camp from interested nonprofits who had previously received a grant from the J. J. Keller Foundation through its competitive grant application process. 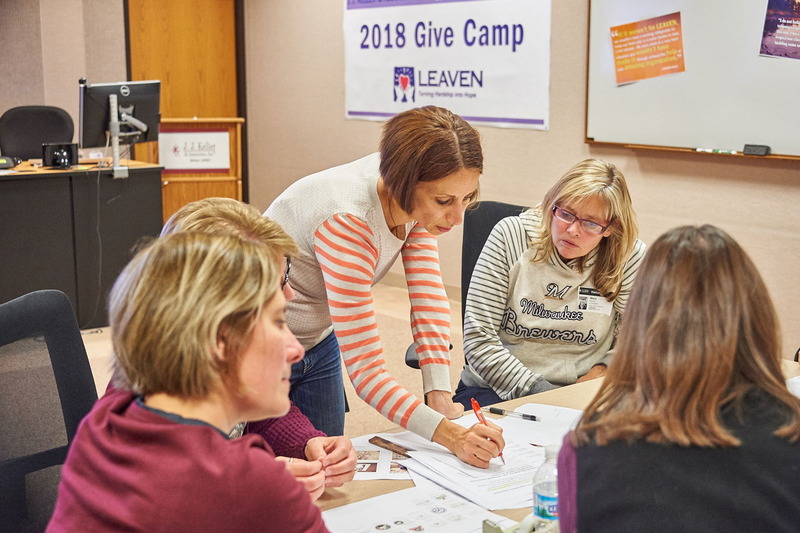 Parsons provided the foundation with a wish list of projects that would help LEAVEN advance its mission, and from there J. J. Keller marketing professionals pinpointed projects they could complete during Give Camp weekend. Founded in 1985, LEAVEN provides emergency financial assistance to address immediate needs while connecting clients with resources to ensure long-term stability. Each year, LEAVEN helps nearly 20,000 people in 6,900 households in Outagamie, Calumet, and northeastern Winnebago counties. www.leavenfoxcities.org. Founded in 1990, the J. J. Keller Foundation, Inc. is a private, family foundation that provides charitable funding to many worthwhile groups within the local community. Partnering with others to maximize the impact for nonprofit organizations, the foundation has supported a number of collaborations in Neenah, Green Bay, Appleton and Oshkosh, all of which have focused on addressing the needs of the most vulnerable within our community. www.jjkellerfoundation.org. Serving more than 600,000 customers, including 90% of the Fortune 1000® companies, J. J. Keller & Associates, Inc. is the nation’s leading provider of regulatory, safety and compliance solutions. Organizations of all sizes rely on our expert insights to help create safe work environments and simplify the complexities of regulatory compliance. Our diversified portfolio of solutions and services, including online management tools, publications, training, forms, supplies, consulting and professional services, is trusted to safeguard workers, reduce risk and build operational confidence. As a privately-held, family-owned company since 1953, we are committed to helping protect lives every day. www.jjkeller.com.